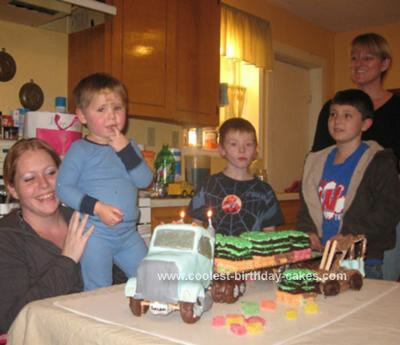 Jordan’s dad is a truck driver for a grass company so his mom wanted this cake for his 2nd birthday. We used pound cake for the cab, covered it in butter cream icing and then rolled fondant. For the lights on top we used candy corns which we cut the orange part off of. For the windows and headlights we made soft candy and shaped aluminum foil to make the shapes. For the license, we used white fondant, black food coloring gel and a toothpick to write his name. The cakes on the bed of the truck are from a 9×13 chocolate cake which we cut thin using thread. Green butter cream icing and green coconut for the grass. The pallets for the grass are made using wafer cookies which were stuck together using watered down powdered sugar (not exactly sure how they were done since Jordan’s daddy did that part). To make the truck stand up, we used dowel rods cut and glued. The trailer and base of the truck are made from cardboard covered in aluminum foil. The wheels are purchased marshmallow cookies (we wanted to use donuts but couldn’t find the bigger ones). We piped gray icing into the wheels after they were put into place. The forklift, fuel tanks and stacks were made from chocolate crispy treats that we made. The stacks and fuel tanks were then covered with rolled fondant. On the forklift, to make the frame, we cut and shaped a piece of cardboard then used butter cream icing to hold the crispy treat in place. The wheels are small chocolate covered donuts. This was a two day job for us and my inspiration came from searching the internet for ideas. I came across this site which really helped with my choice in doing the cake this way.